On 24 Jun 1636, William Taverner married Sarah in Moretonhampstead. Sarah’s surname is on the fold of the page and may be Baker. No credible baptism has been found for her in this parish. Since no children of this marriage are recorded as being baptised in Moreton, we assume they brought up their family in William’s parish elsewhere. We do not know whether this older William is an ancestor of Elizabeth Ellis’s husband. There is a John Taverner in the 1641 Protestation Return for Moretonhampstead. Continuous records for this surname begin in the early 18th century. From the date of his marriage, we should assume that William, husband of Elizabeth Ellis, was born in the 1690s. There is a baptism in neighbouring Drewsteignton in 1699. The 17th century registers have survived for all the parishes around Moretonhampstead. No other plausible baptism has been found. This would make his mother Hannah Christopher, daughter of Edward Christopher of Bovey Tracey. This baptism would make him the same age as his bride Elizabeth Ellis. The surname Taverner alias Avery continued down William’s Moretonhampsted family. It does not occur in the parish registers, but Sylvester Treleaven’s diary for 1799 refers to William’s grandson as James Avery alias Taverner. Two siblings followed this William’s baptism: Henry in 1700 and Mary in 1702. William senior was buried in Drewsteignton on 29 Jan 1731/2. Hannah was buried on 16 May 1748. No Taverners have been found in Drewsteignton before William’s baptism. There are a handful of Averys, but they are usually associated with the name Avery alias Crocker. 1710 April 18 William Scut and Agnis Taverner. Agnis’s baptism has not been found. Taverners are among the earliest entries in the new volume of the parish register, whose opening page bears this cure for rabies. By Sir GEORGE COBB, Bart. cond in an Hour after; and, if wanted, a Third must be given a few Hours afterwards. Children in smaller Quantities, in Proportion to their Ages. →This MEDICINE has been given to Hundreds with Success, and Sir GEORGE COBB,himself has cured two Persons who had the Symptoms of Madness upon them. the Patient be recover’d: This Repetition to be omitted unless necessary. N.B. Take all imaginable Care that the Musk be genuine. For ye use of ye Parish by Dr Pynes…..
1712 Aug 19 Gilbert Taverner married Loyalty Wotton. She was the third daughter of William Wotton and Anna Stediford, born in Moretonhampstead in July 1690. Wottons had been in Moretonhampstead for at least a century. Her unusual name suggests a Puritan family. The first five of William and Anna Wotton’s children were baptised in the parish church, but the sixth, William, was baptised at the Cross Street Presbyterian Meeting in 1702. We may assume that Loyalty grew up in this Dissenting congregation. The Wottons were a strongly Nonconformist family during the 18th century. 1713 Apr 7 James Taverner married Joan Berry. James does not raise a family in Moretonhampstead and may have come from elsewhere. Their arrival so close together suggests that Agnis and Gilbert, at least, are brother and sister. No baptisms have been found for them. We then begin to get baptisms and burials for Gilbert Taverner’s children. In 1719 there is a marriage which did not take place in Moretonhampstead. William Taverner and Elizabeth Ellis, both of Moretonhampstead, married in Exeter Cathedral. The impression is of a family moving into Moretonhampstead at the same time. William may be the younger brother of Agnis and Gilbert, though this would not be true for the Drewsteignton William. There is no previous mention of the baptism of William, son of Gilbert Taverner, nor are there subsequent references to either William or Gilbert Avery. Gilbert is a distinctive name and we can assume that Gilbert Avery and Gilbert Taverner are the same person. The association of these surnames is common in the area. Two generations later, in William’s line, James Taverner is named in Treleaven’s diary of Moretonhampstead as ‘James Avery alias Tavernor’. Aliases can occur when a child is born out of wedlock, but both parents are acknowledged. The combination may then be passed down over several generations. Or the alias may be adopted out of courtesy to a benefactor or to save a name dying out when there are no male heirs. Gilbert and Loyalty Taverner had eight more children after the William Avery whose baptism is recorded above. The first two Williams died, but there was a third, baptized on 6 November 1720. It is possible, though less likely, that this third William was the father of James Avery alias Taverner. In 1740, he married Ann Tremlett. However, the available evidence shows that the more probable father for James is William, son of William Taverner. ELIZABETH ELLIS. We find Elizabeth’s baptism in Moretonhampstead, where William moved from Drewsteignton. Her mother was Joane Woodley. Elizabeth is the youngest of three children baptised in Moretonhampstead. Her father was a yeoman, as was William’s. Her parents also married in Exeter Cathedral, though both were said to be of Chagford. 1719 May 12 Wm Taverner of Moreton-Hampstead in the County of Devon and Elizabeth Ellis of the same. William and Elizabeth had four children baptised in Moreton. The Moretonhampstead register for this time does not name the mother. The Moretonhampstead Freeholders List for 1721 has William Taverner as the only man of that surname. In the 1723 Oath Rolls, both Gilbert and William Taverner were freeholders who went to the Crokerton Well [Crockernwell], Cheriton Bishop, on 24 Sep to swear the oath of allegiance. This oath was a requirement following the Attenbury Plot of Jacobites against the Hanoverian George I. Both men signed their own names. The Freeholders List for 1733 names William Taverner yeoman. William Taverner was buried in Moreton in March 1736. This is probably Elizabeth’s husband. The Freeholders List for 1741 has William Taverner of Sainthill and William Taverner in Town. Since we know that William senior was a yeoman, while Gilbert Taverner is not so listed, we can be fairly sure that his was the family farming at Sainthill. This farm is just south of the road from Moretonhampstead to Whiddon Down, about a mile and a half out of Moreton. 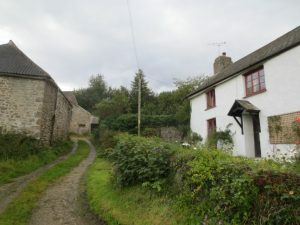 There are two houses: one alongside the track which leads through the farm buildings, and another standing behind and above it. Loyalty Taverner died in April 1751 and Gilbert eighteen years later, in 1770. We do not have a date for Elizabeth Taverner’s burial. The names of Taverner and Ellis continue to be associated with Sainthill through the 19th century. The following two reports appeared in the North Devon Journal. There is some indication that the Taverners may have lived in one house, and the Ellises in the other. Parish registers in DRO and Findmypast.